The Joules Sale is now here! Get up to 50% off women's clothing and accessories. Shop the sale now and bag that bargain you’ve been after. Don’t miss out on great savings. Known for great quality, a great selection and revitalising country fashion for busy families, Joules is as popular as ever. From Mum's go-to dress to Dad's tweed jacket, with a modern twist, of course, right through to the kids in polo shirts in a range of rainbow shades, Joules are a brand we all love to see and be seen in. Wholesome, fresh faced country kids, picnics and pony trekking, printed wellies and snugly gilets - Joules are a fantastic, popular brand who stand for fantastic quality and great designs that will keep the whole family happy, whatever you're doing. 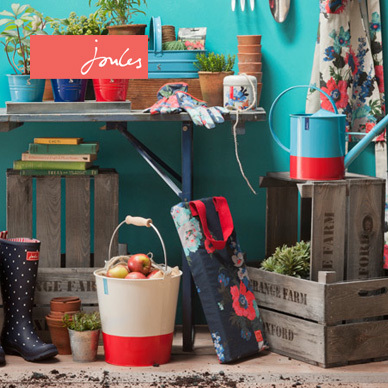 Add Joules to your Favourites list and be the first to know every time they have a Sale on! 1st January 2018 - Joules New Years Day sales for 2018. 7th May 2018 - Joules Early May Bank Holiday sales for 2018, add to your diary now! July 2018 - Joules Summer 2018 sales, joining us? 23rd November 2018 - Joules Black Friday sales in 2018 start on Friday 24th November. Add products from Joules to your Love Sales list. Get the Love Sales button now! The Joules January Sale is now here! Get up to 50% off women's clothing and accessories. Shop the sale now and bag that bargain you’ve been after. Don’t miss out on great savings. At Joules, our Cyber Monday Event are upon us. Our not-to-be-missed deals include savings on clothing and accessories for the family. So what are you waiting for? That Black Friday bargain is just a click away. At Joules, our Black Friday offers are upon us. Our not-to-be-missed deals include savings on clothing and accessories for the family. So what are you waiting for? That Black Friday bargain is just a click away. The Joules Mid-Season Sale is now here! Get up to 20% off women's clothing and accessories. Shop the sale now and bag that bargain you’ve been after. Don’t miss out on great savings.